Question: How do I view the archive file? I accidentally moved a document. Answer: Whether you want to view (and perhaps reactivate) a case, as submission, a filing, etc. ; the process is similar. For this example we will find the inactivated case and then view a document eFiled during the life of the case. On the Cases page, the view selector defaults to My Cases. Change it to Archived Cases (A). You are now shown all your firm's archived cases. Find the archived case in question and click the + sign in the far left column for it (B). The case tabs open - click the Documents tab (C). 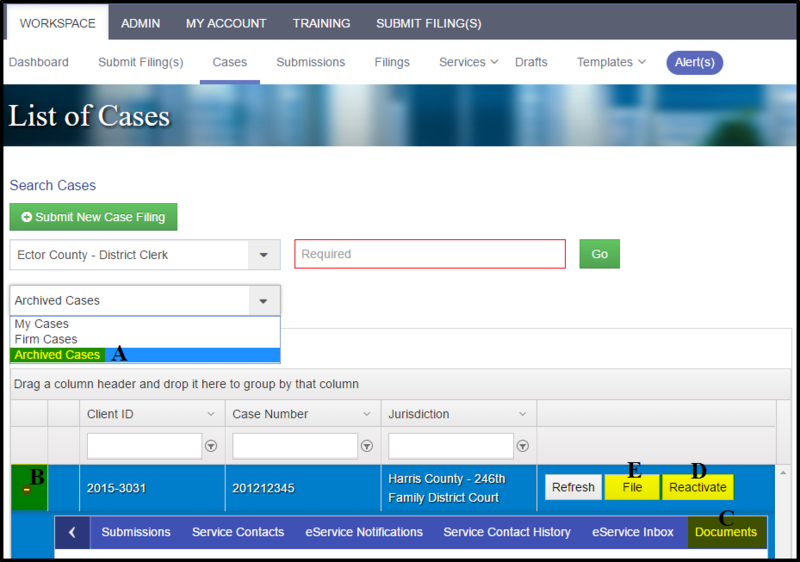 You can now view any document eFiled for the case through FileTime, regardless of the firm submitting the filing. If you want to reactivate the case click the Reactivate button (D). To submit a new filing for the case, click the File button (E). You will use the same method to view archived submissions on the Submissions page and filings on the Filings page.